The Ashley Furniture Charlowe Door Night Stand helps to rest easily with the fact that it is crafted of sustainable mango wood. Saw marks and a richly distressed finish incorporate cool character. The louvered panel door, revealing shelved storage, is a rustic touch. Dimensions: 18.25" x 13.25" x 28"
The Charlowe Door Night Stand White Wash (2-Pack) has many exciting features for users of all types. 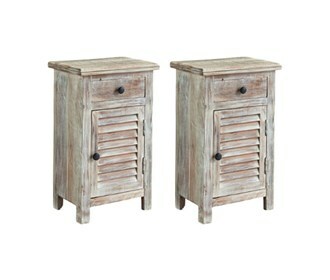 The Charlowe Door Night Stand White Wash (2-Pack) is sold as a Brand New Unopened Item.